A big advantage being a photographer up North in the dark time of the winter is that you do not need to wait long to have the blue hour. Like here the clock is not yet 4PM and the blue hour is already present. 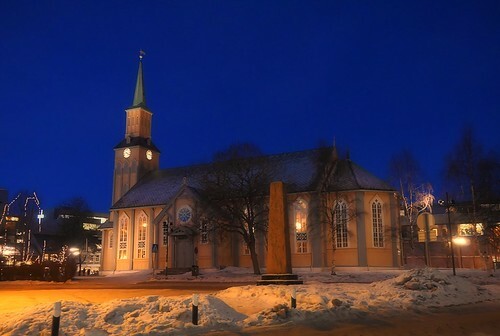 This photo is of the fine wood church Tromsø Cathedral placed right in the center of the town. Tromsø Cathedral (Norwegian: Tromsø domkirke) is a cathedral in the city of Tromsø in Troms county, Norway. It is the episcopal seat of the Diocese of Nord-Hålogaland in the Church of Norway. This cathedral is notable since it is the only Norwegian cathedral made of wood. The church is built in Gothic Revival style, with the church tower and main entrance on the west front. It is probably the northernmost Protestant cathedral in the world. With over 600 seats, it is one of Norway's biggest wooden churches. It originally held about 984 seats, but many benches and seats have been removed over the years to make room for tables in the back of the church. The first church in Tromsø was built in 1252 by King Haakon IV of Norway as a royal chapel. The present cathedral was consecrated on 1 December 1861 by the Bishop Carl Peter Essendrop. In 1862 the bell tower was completed and the bell was installed. All of the interior decorations and art were not completed until the 1880s.